Shell is a leading energy and petrochemicals company with thousands of gas stations all over the globe. If you prefer Shell gasoline to any other brand, you should consider buying it with a special rewards credit card that offers gas rebates. Why? Because a gas rebate card is designed to help you get some of your money back on each gas purchase. This is a great way to save money on your routine gasoline and auto maintenance services! In addition to their tempting gas rebates, the best gas rewards credit offers come with low interest rates on purchases, no fees and plenty of other financial benefits and perks. Apply for a gas rebate credit card online, and explore its great saving opportunities and payment convenience! When you fill up your car's tank with Shell gasoline, you can rest assured that you are getting the highest quality gasoline at the best possible price. However, if you want additional savings, consider gasoline credit cards. 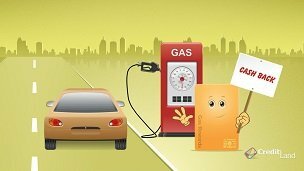 Gas rewards cards help you benefit from each gas purchase you make by awarding you a percentage of the gas price. The best gas rebates may give you back up to 5% of the amount spent, which results in considerable savings over the long run! Plus, rebates may be earned on purchases other than Shell gasoline, including groceries, medicine and many more items. Once you earn a specified rebate amount, you can claim your rebates at the end of each billing cycle and receive them as a check or a gift card. You can also choose to have the rebates credited to your account to reduce the current balance! However, keep in mind that the earning and redemption of gas rewards are subject to the rewards program rules which you'll find attached to your card statement. You should carefully read the rules to get the most rebates possible. Please note that gasoline rewards cards are generally issued only to customers with good to excellent credit scores. Make sure to verify your eligibility before you apply! Is there a "Shell Oil" credit card? If so, what is the price reduction of their gasoline using their card? It used to be 5%. Which card yields the best reward for buying Shell gas?